La Rambla is the best known and most characteristic tree lined avenue in Barcelona. It runs from Placa de Catalunya to the Mirador de Colom , a tall column with a statue of Columbus on the top. The Mirador de Colom is on the sea front by the Port Vell (Old Port of Barcelona). Metro station Catalunya Lines 1, 2, 3, 6 & 7. Buses number 14, 17, 18, 22, 24, 57. La Rambla is full of Street performances, mime artists, street vendors, buskers and living statues. As in anywhere that can be crowded be aware of pick pockets. La Rambla actually consists of 5 sections under different street names that run end to end. Joan Miro Mosaic pavement dating from 1976. Teatre de la Liceu (Liceu theatre and Liceu opera house), One of the finest opera houses in Europe, rebuilt after a devastating fire in 1994. Palau Guell. This palace was designed by Antoni Gaudi for Count Eursebi Guell in 1886. 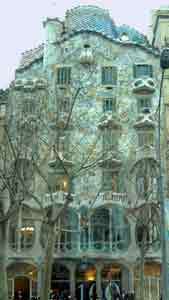 Gaudi was give an unlimited budget to build this residence and meeting place for social and community events. Visit the museum de les Arts del Espectacle, the roof to see the magnificent roof top, and tiled chimneys and the subterranean stables. Casa Batilo. 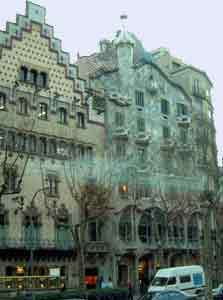 An apartment block also built by Antoni Gaudi.The balconies are designed to look like bones. The building facade is covered in bright multi coloured tiles. Description: A single 87 mt high column topped with a 7mt high statue of Christopher Columbus. Take the lift to the top for magnificent views of the harbour and the City of Barcelona. Built in 1888 fo the World Expedition. Christopher Columbus disembarked here in the Port Vell (Old port) when he returned from his historic discovery of America. Centrally situated between the Barri Gotic (Gothic quarter) and the nightlife area of L'eixample. A place to sit and do some people watching. In the past there was a charge to sit, now free.